We’d love your help. Let us know what’s wrong with this preview of Huckleberry Harvest by Jennifer Beckstrand. To ask other readers questions about Huckleberry Harvest, please sign up. ‘The Matchmakers of Huckleberry Hill’ series continues to amaze me! 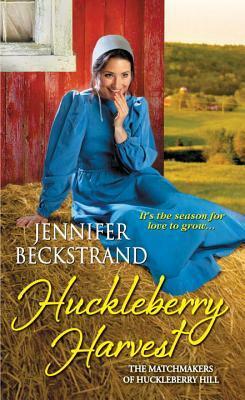 Huckleberry Harvest is the fifth book in this series by Jennifer Beckstrand, and each one is better than the last. This one is funny, poignant, and refreshingly transparent; the author has candidly written about a difficult subject with love and dignity. Anna and Felty Helmuth have been married for more than six decades, and ‘retired’ (not!) to beautiful acreage on top of Huckleberry Hill. Anna’s current goal is to see all of he ‘The Matchmakers of Huckleberry Hill’ series continues to amaze me! Huckleberry Harvest is the fifth book in this series by Jennifer Beckstrand, and each one is better than the last. This one is funny, poignant, and refreshingly transparent; the author has candidly written about a difficult subject with love and dignity. Anna and Felty Helmuth have been married for more than six decades, and ‘retired’ (not!) to beautiful acreage on top of Huckleberry Hill. Anna’s current goal is to see all of her adult grandchildren married to suitable Amish spouses. For those not yet married, she is providing ‘encouragement’ in the form of matchmaking. While Felty isn’t as sold on the idea, he loves to make his ‘Annie Bananie’ happy, so he helps when it doesn’t get too out of hand. This time Anna has set her sights on granddaughter Mandy, visiting for only four weeks even though she doesn’t want a husband. With so little time, Anna picked up her knitting needles and took to the streets to find the single young men in their district. As the men were “interviewed”, they received one of Anna’s special creations. Mandy, to her unending embarrassment, went with her best friend Kristina to spy on the ‘love of her life’, Noah work. In her excitement, Kristina pushed Mandy into the river and she would have drowned if Noah had not rescued her. In the upcoming days, she learned that Kristina and Noah never dated, but she refused to leave him alone. As the days pass, Mandy and Noah begin to talk as he re-roofs Anna and Felty’s home. As they do, they fall for each other. Oopsie. Wait until Kristina finds out! When Mandy learns Noah’s “shameful” secret, she tried to do what she usually did best – fix the problem. Noah didn’t want Mandy to fix the problem and didn’t want anyone to know about it. He believed nobody, even God, could change the situation. Their growing love for each other could never blossom because of his need to take care of his family instead of seeking God’s will. Mandy knew she would soon return to Charm, Ohio. What would she leave behind – a used-to-be-best-friend? Of course, her beloved Dawdi and Mammi. A broken heart? A list of hopeful suitors? The primary characters in this novel are fully developed folks, seemingly so real that I wish I could take a walk and visit Anna and Felty; they are a stitch to watch! Anna and Felty demonstrate a life of faith and love. The family members and even the young men who came to meet Mandy were as defined as necessary for their roles. Only Kristina seemed odd because of how she behaved like child and tuned out what she didn’t want to hear. Oh. Maybe I’ve done that, also? Tuned out truth? The plot begins like those in the other books in the series. What is different this time is the specific problem in Noah’s family. This is not a fluffy book of romance; it is a novel of real-world problems that are not insurmountable – with God. I am extremely impressed with how Jennifer Beckstrand writes, showing grace and dignity to both Noah’s father and his family. Whatever denomination a family worships in, this challenge occurs, and can cause behaviors that are shown here, and then some. As frustrating and confusing as it is, it does not diminish God’s ability to work and change the human heart, nor does it diminish God’s unconditional love for His children. Spiritual lessons that we each need in our own way are gently demonstrated. Huckleberry Harvest is absolutely the best in the series of the ones I’ve read, and I most highly recommend it. As the other novels are, this can be enjoyed and appreciated by adults of any age as well as teens. I’m not sure how I can wait for the next novel to come out later this year! Thank you, Jennifer, for this amazing novel! May many, many read and be blessed by it! With a grateful heart, I received a copy of this book from Netgalley for the purpose of an honest review. All opinions are my own, and no monetary compensation was received for this review. I can not believe I'm late reviewing THIS book! Jennifer - you should smack me. But seriously... I thought I had already reviewed it. It was only when I went looking for the review that I realized why it wasn't there. I don't know how Jennifer does it – I mean she comes up with these wonderful stories that a I can not believe I'm late reviewing THIS book! Jennifer - you should smack me. I don't know how Jennifer does it – I mean she comes up with these wonderful stories that are full of such life and good humor and faith – and there are no two alike! So... not only will Huckleberry Harvest make you laugh, it will make you think. It will also make you frustrated at how thick-headed some people can be and sigh over how exciting love can be! In short, it's great, it's humorous, it's exciting, it's REAL! I did say it's the best one yet right... ? Yes, I thought I did! So, what are you waiting for? GO... get your copy! Don't miss it!!! The publisher granted me digital access to this book through Net Galley in exchange for an honest review. I received no compensation for reading the book or for posting this review here or on any other site. I have previously read three of the books from this Amish fiction series called ‘The Matchmakers of Huckleberry Hill’. I absolutely adore the delightful core characters in this series! Anna and Felty Helmuth are octogenarian grandparents on a mission to find marriage matches for each of their grandchildren. Anna and Felty’s antics are hilarious. Felty, called Dawdi by his grandchildren, is known for his humorous renditions of old hymns and songs. He enjoys playing the license plate game when he’s out and about on the road, and he thinks his wife of sixty-four years, Anna, can do no wrong–even when it comes to her crazy cooking adventures. Anna, called Mammi by her grandchildren, is known for her prolific knitting projects and her poor cooking and baking skills. She makes potholders to give to eligible suitors for her granddaughter, Mandy, in this book. The other girls in the community call the boys with the potholders The Potholder Club. Anna has decided to find a husband for Mandy (visiting from Ohio) during her four-week summer stay on their farm. Mammi concocts various muscle tests and questionnaires to rate the local young men in an effort to find Mandy the best possible match. All kidding aside, Mandy and Noah, the main male character in this story, must deal with some serious issues surrounding his father’s alcoholism and Mandy’s take-charge personality. Noah, especially, goes through some heart-wrenching events during the book. The author does an excellent job of guiding her characters through these circumstances in a realistic manner. The final few chapters of the story are touching and exceptionally well-written. I loved the final chapter–which I won’t spoil for you by revealing its contents. Suffice to say this book provides above average laughter and enjoyment in the Amish fiction genre. Anna and Felty Helmuth are at it again! They're matchmaking their grown-up granddaughter, Mandy, to a suitable husband. Mandy's first day in Bonduel, WI, she is taking care of business for her broken hearted best friend Kristina, by visiting the young man who broken Kristina's heart. What Mandy does not know is that Noah Mischler will be at her grandparents Helmuth's house the next morning to switch cooking stoves along with group of young men, who are bachelors. Noah Mischler is a young handy ma Anna and Felty Helmuth are at it again! They're matchmaking their grown-up granddaughter, Mandy, to a suitable husband. Noah Mischler is a young handy man in Bonduel area of Wisconsin. He has a secret that he is hiding from the rest of his Amish community, except the bishop and Felty Helmuth who both know what Noah is handling at home. Will Noah's hidden secret send Mandy running to the other Amish suitors that her grandmother has had her entertaining? Will Noah learn to trust others and accept help for him and his family? If you want to be entertained while reading then "Huckleberry Harvest" by Jennifer Beckstrand is the book for you to read and you wont be disappointed. And if you are like me and have not read the whole series, dont be alarmed each book are a stand alone with a few characters over lapping from the previous books before. I plan to read more book by Jennifer Beckstrand in the near future. This is Granddaughter Mandy’s story, and Annie and Felty are at it again, of course. Annie has away with cooking, that would bring tears to the eyes of any cast iron stomach, but she is so delightful that p I received my copy of Huckleberry Harvest a little while ago, I didn’t open it right away, it was like a piece of candy that you absolutely love, but savor and save for a few days. I knew what I was going to find once I open the pages, and sure was not disappointed, just didn’t want it to end. Please see my review in the June Issue of RT Book Reviews Magazine. Not a fair rating since I only read the first chapter or so. I wasn't amused at the idea of having relatives trying to matchmake. A little slow to take off but it was worth the read. It is almost impossible for readers not to fall in love with dear grandparents, Anna and Felty Helmuth! She is the world's most horrible cook and avid knitter! He must have lost all ability to taste as he is the only person alive to enjoy her cooking and he has the sweetest disposition. Anna is once again up to her matchmaking with the grandchildren and this time, Mandy, is the target for Cupid's (or Anna's) arrow. The poor unsuspecting fellows are lured to their home with promises of cookies an It is almost impossible for readers not to fall in love with dear grandparents, Anna and Felty Helmuth! She is the world's most horrible cook and avid knitter! He must have lost all ability to taste as he is the only person alive to enjoy her cooking and he has the sweetest disposition. Anna is once again up to her matchmaking with the grandchildren and this time, Mandy, is the target for Cupid's (or Anna's) arrow. The poor unsuspecting fellows are lured to their home with promises of cookies and a knitted potholder and the chance to win their granddaughter's (Mandy's) hand in marriage. Mandy is not thrilled with the efforts but she loves and respects her dear Mammi so she grudgingly goes along with the many trials, meals, tests, and setups. Felty has hired Noah to do so home repairs while Mandy is there visiting in their home and Mandy is there to cheer her best friend, Kristina, up after having her heart broken by none other than, NOAH! What Mandy never planned on doing happens in the midst of all this turmoil......she falls in love with Noah. Noah, of all people, the one she never cared for......grumpy, downcast NOAH! I have read the entire series in order and I just adore Anna and Felty and the dear unsuspecting victims of their matchmaking efforts! Anna is so cute that everyone loves her, even though her cooking is simply atrocious! She loves knitting potholders, scarves, and sweaters with very bright and vivid colors! Mandy is forced to help her knit the many potholders to give to the parade of young men coming to pursue her own hand in marriage. This book could be read as a stand alone, but I personally love the feel of growing along with the characters, especially in this series. The characters are interesting, fun, lively, and just feel like some of the readers' very own relatives or friends. The Huckleberry Hill matchmakers are at it again! Anna and Felty Helmuth's granddaughter is visiting for a month, and Anna is determined to find Mandy a husband during that time. Jennifer Beckstrand adds hilarity to a serious plot! Some serious issues arise in this author's latest novel, but I laughed aloud several times as unique humor is interwoven with a complex series of events. The characters throughout Huckleberry Harvest are colorful and varied, the Amish countryside lush and alive! Noah The Huckleberry Hill matchmakers are at it again! Anna and Felty Helmuth's granddaughter is visiting for a month, and Anna is determined to find Mandy a husband during that time. Jennifer Beckstrand adds hilarity to a serious plot! Some serious issues arise in this author's latest novel, but I laughed aloud several times as unique humor is interwoven with a complex series of events. The characters throughout Huckleberry Harvest are colorful and varied, the Amish countryside lush and alive! Noah plays a very strong role, and plays it well. Although his stubbornness gets in his way at times, his intentions are solid and godly. Mandy is caught between a rock and a hard place, and appears to teeter between teenager and adulthood and back again with her giggly childhood girlfriend sweeping her into childish capers. Significant issues arise throughout this story of giggling girls and a young man who has no time for silly games. Mandy's character is one of charity, a compassionate, generous girl whose intentions are sound, but go beyond the boundaries of propriety. Alcoholism and a broken family, as well as misunderstandings add drama to the plot, and with the blending of humor and serious emotional and physical incidents, this is a page-turner from the start. I highly recommend this entertaining book, and feel that the author did a wonderful job of portraying tough struggles realistically with that thread of humor that breaks the tension. Disclaimer: I received a copy of this book from the author in exchange for my honest review. All opinions expressed are my own, and no monetary compensation was received for this review. WOW! Just when I think I can guess what Anna’s going to do next – I get a BIG surprise! Of course, we know how she enjoys matchmaking... and so far she’s been very successful. This time I think it’s possible she was trying a bit too hard -- she certainly was surprised when one of the boys she tried to match her granddaughter with wasn’t Amish! This time Felty steps in and tries his hand at matchmaking! As usual, Anna does her thing, pulling him along for the ride. But this time something's different! I'd love to tell you more, but I just can't! You HAVE to read this for yourself! Huckleberry Hill was awesome, but the sequels just keep getting better and better! I REALLY hope Kensington knows what a GEM they have found in Jennifer Beckstrand! Every book she writes is fresh and original – and just plain fun to read. Each story is wonderfully different – I don’t know how she does it – and each character is unique, yet fits into the family perfectly! One grandson was determined to not marry; another was eager to marry; yet another had been arrested several times! As a series, it’s familiar and comfortable, but nothing – except for Anna’s cooking – is the same from book to book. Even Anna’s matchmaking is a little different with each story. It’s a good thing Amish families are so big – Anna and Felty have plenty of grandchildren left for Jennifer to write about! Jennifer takes you on a wild ride with Anna and Felty. You usually end up in the same place, but you’re a happier person at the end. Read the Huckleberry Hill series… you won’t want to miss a single one! Don’t miss this amazing series! I have never been a believer in a faith or a higher being. However, the more I read of this gentle genre - and most especially of this particular author, the more I wonder. Ms Beckstrand does not hit you over the head with a sledgehammer to get her religious points across, she uses humor, compassion and common sense to make her points AND tell her story. Also another thing I love about these books and especially this one, is that she takes a very important and timely story-line and sort of mixes I have never been a believer in a faith or a higher being. However, the more I read of this gentle genre - and most especially of this particular author, the more I wonder. Ms Beckstrand does not hit you over the head with a sledgehammer to get her religious points across, she uses humor, compassion and common sense to make her points AND tell her story. Also another thing I love about these books and especially this one, is that she takes a very important and timely story-line and sort of mixes it with a dose of humor along with a large dollop of romance to engage us in the story. There is always a happily ever after for the couple, but she doesn't fudge when it comes time to the important things. In this book the hero, Noah Mischler's father is an alcoholic -this is a very important aspect of this story and while there is much time spent in dealing with Noah's father there is no waving of a magic wand to 'cure' the alcoholism. The story-line is dealt with fairly and just like it would be in 'real' life. This happened with the last novel in this series also. This was a good story. It showed that people are people in every walk of life, and don’t always handle trials healthily. This was the story of Mandy and Noah, and Mandy’s ‘friend’ Kristina. She drove me crazy! I liked that Felty was the matchmaker this time! I love that this series is not only about matchmaking, it introduces life's trials. I love this sappy series. The lighthearted humor just leaves you feeling good. This is my favorite in the series so far. Enjoyed this book! Loved how humorous it was. Looking forward to reading more. Wow! Huckleberry Harvest is another 5 stars book by Jennifer Beckstrand. Anna and Felty Helmuth's granddaughter, Mandy Helmuth, is in Bouduel, WI to cheer up her friend, Kristina. Mandy believed Kristina about Noah Mischler breaking up with her until gradually the truth is revealed through some very childish antics by Kristina and other friends toward Noah? Anna is more determined than ever to see that Mandy is married before she goes back to her family in Ohio. Anna takes Felty along as she goe Wow! Huckleberry Harvest is another 5 stars book by Jennifer Beckstrand. Anna is more determined than ever to see that Mandy is married before she goes back to her family in Ohio. Anna takes Felty along as she goes into town and other areas surrounding Bouduel to have young men come to Huckleberry Hill to try out for jobs. Anna enlists Mandy to help her with knitting potholders for all the young men she invites to Huckleberry Hill so they can meet Mandy. After all, Anna is known for her knitting and how everyone will have something she has knitted before they leave Huckleberry Hill. Noah is not one of the young men that Anna invites to Huckleberry Hill to be introduced to Mandy. However, Mandy meets him when he is installing a new gas stove for Anna and Felty. Only to discover this is Kristina's boyfriend that she had told off the night before. But Mandy insists she is able to help him with measuring for the stove. Noah is very handy with doing all type of work for in the Amish community of Bouduel. However, Noah is not interested in dating anyone because of his hidden secret with his father. However, Mandy witnessed Noah's dad hitting him outside of a bar one evening and insisted on helping him. Will Noah open his life up to Mandy? Or will Mandy continue to invade Noah's life? After all, Anna and Felty are so busy setting Mandy up with other young men that she's not sure what she is doing herself. Will Kristina and Mandy's friendship change because Mandy wants to be involved in Noah's life? Huckleberry Harvest is true to life when an addiction separates a family like Noah's family. Will Noah be able to come to a new realization of how much God loves him along with others wanting to help him and his dad instead of carrying the burden alone? Read this heartwarming and at times heartbreaking story. Readers be prepared for some tears as you read Huckleberry Harvest. You will not want to stop until you read the last page. Huckleberry Harvest by Jennifer Beckstrand is such a charming book. Anna and Felty Helmuth are matchmaking again. This time they want to find someone to marry their granddaughter, Mandy Helmuth. Mandy is visiting from Charm, Ohio for four weeks (five if Anna has her way). Anna plans to introduce Mandy to every eligible male within 50 miles (at least). Noah Mischler is the man who can fix machines. He does a lot of different odd jobs around the area. Felty has Noah fixing their roof. Mandy meets Huckleberry Harvest by Jennifer Beckstrand is such a charming book. Anna and Felty Helmuth are matchmaking again. This time they want to find someone to marry their granddaughter, Mandy Helmuth. Mandy is visiting from Charm, Ohio for four weeks (five if Anna has her way). Anna plans to introduce Mandy to every eligible male within 50 miles (at least). Noah Mischler is the man who can fix machines. He does a lot of different odd jobs around the area. Felty has Noah fixing their roof. Mandy meets Noah on her first day in Bonduel. Mandy’s best friend, Kristina and her family moved to Bonduel a year earlier. Kristina tells Mandy that Noah broke up with her with a text message and her heart is broken. Mandy goes to Noah’s house and lectures him on manners. Noah, while noticing Mandy’s cute freckles, tells her there are two sides to each story. Over the next few weeks, thanks to Felty, Noah and Mandy are thrown together frequently. Mandy does indeed discover that the truth about Noah and Kristina’s relationship is quite different from Kristina’s version. Noah, though, gets prickly whenever his family is mentioned. Mandy likes to fix problems, and sticks her nose in Noah’s business. One can only hope things will turn out well for Noah and Mandy. I found Huckleberry Harvest an entertaining and engaging book. It is the fifth book in The Matchmakers of Huckleberry Hill series. I give Huckleberry Harvest 4.5 out of 5 stars. I found Kristina’s character just a little too bit silly. I found myself wanted to shake some sense into the girl (you will see what I mean when you read the book). I eagerly look forward to reading the next book in this series. I received a complimentary copy of Huckleberry Harvest from NetGalley in exchange for an honest review. The review and opinions expressed are strictly my own! Anna and Felty Helmuth are grandparents who love their grandchildren. They would do anything to make sure that their grandchildren are all happily married to the perfect person. This book is part 5 of the Huckleberry Hill series which takes place in Bonduel, WI. This is an Amish village that I have visited myself which makes the book special for me. This book will be available in May 2015. Mandy comes to visit Anna and Felty as well as her best friend, Kristina from her home in Charm, Ohio. No so Anna and Felty Helmuth are grandparents who love their grandchildren. They would do anything to make sure that their grandchildren are all happily married to the perfect person. This book is part 5 of the Huckleberry Hill series which takes place in Bonduel, WI. This is an Amish village that I have visited myself which makes the book special for me. This book will be available in May 2015. Mandy comes to visit Anna and Felty as well as her best friend, Kristina from her home in Charm, Ohio. No sooner does she arrive than well-meaning Anna sets out to find Mandy a beau. And this beau must meet all the requirements, good teeth etal! Mandy also meets Noah, who doesn't make a good impression on her in the least. She does find out that Kristina considers him her property and involves Mandy in her plans to get Noah! But Noah has secrets that are not easily shared and that are difficult for him to deal with. Mandy tries to help only to find her help is not wanted. Anna continues to find good suitable matches for Mandy while Felty has hired Noah to do some work on the house. The story unfolds in a most captivating way. I couldn't put it down. The story brings out the feelings of family and community trust, and help. None of us can do it all alone. We need each other. And others in our lives want to help when and how they can. The characters were very enjoyable and the book will hold your attention. And the storyline was so good. You will hate when this ends. I wanted it to keep on going! Can I give 10 stars? Yes! 5 just will not do! Now to wait for the next book, Huckleberry Hearts which will be out in Dec. 2015. As I've said in previous reviews -- you can count on a Jennifer Beckstrand "Huckleberry (anything)" book being an great read. Huckleberry Harvest is the best yet of Anna and Felty Helmuth's adventures in matchmaking for their unsuspecting grandchildren. Anna's cooking, knitting, and scheming, along with Felty's subtle cunning provide the setting for a touching story that mixes deep feelings with a healthy dose of humor. Jennifer has taken a common premise through five books, but has kept the stor As I've said in previous reviews -- you can count on a Jennifer Beckstrand "Huckleberry (anything)" book being an great read. Jennifer has taken a common premise through five books, but has kept the story fresh each time. Her creativity is evident as her continuing matchmaker characters change little from story to story even as their methods of operation vary as needed for the moment. The strength of this story -- and what I think made it my favorite -- is the deep look into the challenging experiences and feelings of the main characters, Mandy and Noah. In this book Jennifer tackles a very difficult subject -- but she does it with care and sensitivity, showing her ability to write entertaining fiction while keeping things real. I highly recommend Huckleberry Harvest to fans of Amish fiction or to anyone looking for a delightful story. Thanks to Jennifer and her publisher for providing a copy of this book in exchange for my honest review. I absolutely LOVE this series. An Amish grandmother who knits like crazy -- in bright colors yet but even her bishop doesn't deny her the pleasure of her many colors. She also delights in find the "perfect" spouse for her grandchildren. I have to warn you that Mammi is a bad cook. And a delight. I tend to chuckle and laugh out loud while reading about her. "Tomorrow morning we're having Eggs Benedict. I've never made it before, but the picture in my recipe book looks delicious. I just have o figure out what a poached egg is,, and we'll be all set." ~ Did I say she collects cookbooks & constantly tries new recipes. Her husband loves her. Her children & grandchildren cherish her. And NO ONE can or even thinks about trying to get her to stop. I hope she doesn't. Our stories would stop. You see this is one character that becomes so real -- a joy to read. I have NOT read these books in order and it doesn't matter although I think you should start with "Huckleberry Hill", the first book in the Matchmakers of Huckleberry Hill Series. At least I did get that part right--I read that one first. Huckleberry Harvest was a particularly funny installment in the series because Anna has gotten a little too sure of her giftedness in the matchmaking department, so much so that she begins matching her granddaughter Mandy without exactly having a match in mind for her. She completely ignores wise Felty's suggestion and proceeds to bring every eligible young man to Huckleberry Hill to meet Mandy while completely ignoring Noah, the young man Felty keeps hiring to do odd jobs around the house. Whil Huckleberry Harvest was a particularly funny installment in the series because Anna has gotten a little too sure of her giftedness in the matchmaking department, so much so that she begins matching her granddaughter Mandy without exactly having a match in mind for her. She completely ignores wise Felty's suggestion and proceeds to bring every eligible young man to Huckleberry Hill to meet Mandy while completely ignoring Noah, the young man Felty keeps hiring to do odd jobs around the house. While a little hard to believe, Anna's cluelessness makes for some really funny, albeit ridiculous, situations throughout the book. This is book 5 in a series, but no need to read the books in order, nor start at the beginning. Grandparents Anna and Felty join forces yet again to make a love match between a beloved young relative and a Bonduel citizen. The story depicts young love at its sweetest, and mature love at its best. Beckstrand writes with humor, tenderness, and honesty. I love the characters and dialogue, and always, always the adventuresome comedy! I highly recommend the Huckleberry series for young and old alike, This is book 5 in a series, but no need to read the books in order, nor start at the beginning. Grandparents Anna and Felty join forces yet again to make a love match between a beloved young relative and a Bonduel citizen. I highly recommend the Huckleberry series for young and old alike, especially those enamored with Amish culture.